If it was as difficult to buy and sell on the Stock Exchange as it is to raise Venture Capital, investors would call it more than a technical glitch! It is difficult to assess the level of failed deals. I have heard estimates that 90% of funding deals <$500k fail and 75% of those below $2m fail too. This suggests to me that friends and families are more than doing their bit to create employment in the North America and Europe by supporting these companies when the VC market fails them. I want to discuss why this market is so inefficient and to see whether there is anything that either side can do to improve the situation. 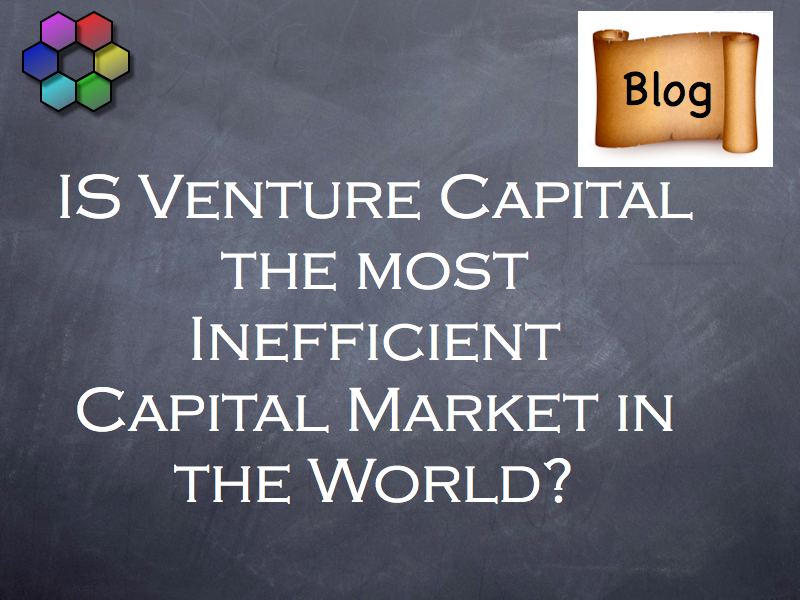 Lets look at the situation from the side of the Venture Capitalists. Once a VC raises a 10 year fund, say $100m, they look to deploy this in the first three to five years of the fund. Therefore these funds are looking to get $20m a year out of the door and into companies. The team to do this may have as many as 10 people in it. Don’t get too excited by this. Two of these will be Partners, two more experienced Deal Executors, a couple more are less experienced “bag carriers”, sorry, I mean Analysts. The remainder will be Administration, Marketing and someone to answer the phones and write letters. This means that most of the deals that come in unsolicited, get reviewed initially by probably the two Analysts. This is the first reason that you have to write a good investment summary! A typical firm will see around 500-600 business plans/summaries in a year. This is around 40-50 a month, around 10 a week (20 days a month even if they are 15 hour days!). The same firm is likely to do up to 5 deals a year, one every two months! Look at it another way, the fund will want to make 20-25 investments in their $100 million fund, over 5 years, its 4-5 deals a year. So your chances of getting funding from any single investor is around 1%. 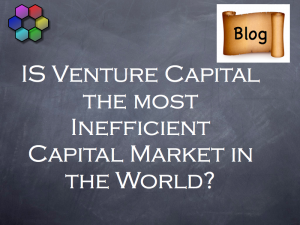 Unfortunately, if you see 100 VCs, your chances improve somewhat but not to 100%. I think that VCs should try to be more specific about their investment criteria on the website, but of course, ultimately this is not in their interest as they want to see as broad a deal flow as possible, in case they miss the next Facebook! What can you do to improve these odds? Well, lets look at it from the Company’s perspective. Deal Types: in Private Equity; there are a whole range from Generalist to Specialist (e.g. Turnarounds, Public to Private, Buy and Build), but I am going to keep focused on the VC market here where the investors primarily focus on the Stage of Development of the company. Financial Development: Revenues: Pre or Post revenue. Take it from me, pre-revenue investment from VCs in Europe is very difficult to raise, in the more sophisticated, mature and larger US market it is easier. Profitability: Profits: Cash flow positive, breakeven, profitable? VCs are not investing to take early stage, product risk. They are looking to invest in companies once the questions – Can the product sell? Is there a problem for which this is a solution? – have been answered. Size of Investment; this genuinely varies: for VCs you expect them to at least invest £500k or $500k but all have minima. There is a logic to this. It is very difficult for a small team to manage a large portfolio with lots of small investments and from a portfolio theory perspective, a VC wants to make a limited number of reasonably sized bets in its investee companies. Management; make sure you have a strong, successful (previous successful start up track record in the same sector is a distinct advantage) team. Management, Management, Management: See the paragraph above in case you missed it. This really is one of the most critical factors. The VC is essentially backing the team to successfully execute the business plan and weak management teams don’t get backed. Competition: there is always competition. If you have not found it you don’t know your market and claims that there is no competition is a telling sign to a VC that the Management team is not on its game. Returns: VCs are fundamentally looking for a 10x return so their in price, the pre-money valuation and the expectations of any future funding rounds are important to them and you can expect them to negotiate. Hot Trends: this is the one that you do not find on their website. I always ask VCs what is “hot” for them at the moment. This gives me really valuable information about their appetite for certain types of companies and enables me to bring deals to the VCs which they are more likely going to want to engage with. As you know, fashions and fads change and so do these – about every six months. Once you have honed your long list to a couple of hundred potential investors, you now need to find a way to approach them. I am not a great believer in filling in online forms. As you can see from the discussion above, the attention span of a VC team is challenged to say the least! An approach from some one who knows them or a mutual contact who knows them is the best chance of getting past the the initial filtering process. A really good way to find how to do this is Linkedin. If you are not already using it, you should definitely start building your network today. Be prepared to contact between 50 and 200 VC investors (in Europe), I would suggest that in the US the number os probably between 30 and 100. This means several calls, emails, follow up and a lot of persistence. The initial negative responses come in quickly. Give the VCs initially a week to 10 days to process the summary internally and hopefully get some initial interest from a few of them. After this initial period, put in follow up calls to make sure your approach has not already hit File 13 (thats the round metal receptacle under the desk of the analyst). If you get an initial meeting with a VC, well done! Now you only have three to six months of haggling in front of you. Lets go back and look further at how inefficient this market really is. From a numbers perspective, there are thousands of investment events every year but this still remains a small proportion of the businesses seeking funding. I do want to be fair. Many of these companies are either not good enough or ready for investment and there are good reasons why they do not get funded. However, without a mentor, an experienced adviser or investor, it can be very difficult for these businesses to learn why they have not been successful. There is the same quality issue for the Venture Capitalists who can spot an under prepared business from a mile away in a fog at midnight. Make sure your collateral – Executive Summary, Business Plan, Financial Model, Management Presentation and Elevator pitch is as good as it can be. I often hear VCs complain about the scarcity of good quality deals. The summary of all this is that management teams can spend months seeking investment while still trying to build their businesses, a very distracting and time consuming process. There are moves a foot to create online investor exchanges for VCs, similar to AngelList which (as its name suggest) is focused on the Angel market. There are considerable regulatory hurdles to this although steps are being taken, particularly in the US, to address these. 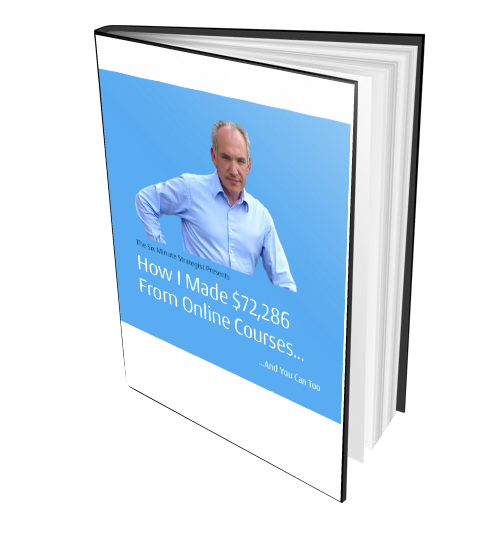 Six Minute Strategist Start Up Course – Is this for you? Are you struggling to get your Start-Up Started? Do you need to learn how to pitch to investors? ← 6MS Episode 52 Do you understand the meaning of Acquisition Rationale? A company can achieve great success by opting to venture into the public markets as a public company. The risk involved in dealing with Venture Capitalist can be far too much risk for those companies desperately in need of capital. We’ve all heard many stories of company founders being fired from their own company. Steve Jobs and Apple is a perfect example of this. Going public provides a lesser risk to the business involved and provides many avenues for a company to maximize it’s corporate potential.